HP<->MP The functions of independent materia are independent of user control. Some are triggered by an enemy attack (Counter) or by a battle condition (Cover, Underwater). When an independent materia reaches a new level, its function is permanently upgraded (when applicable). (Forgotten Capital) Cave has narrow vertical gaps between ledges. Located at bottom of long ladder. - Wonder Square This materia can only be exchanged for 2000 GP once. - Wonder Square This materia can only be exchanged for 1000 GP once. - Chocobo Square This materia is one of the prizes offered at the Class A and Class S race levels. Chocobo Lure only works in places on the world map marked with Chocobo footprints. Equipping two Chocobo Lure materia of the same level is twice as effective as equipping only one. Two level 3 Chocobo Lure materia provide the maximum encounter rate. Luck + 01 Chocobo farm Choco Billy (in the barn) offers only one Chocobo Lure for 2000 gil in Disc 1. Another Chocobo Lure lies in front of the Chocobo pen to the far right in Disc 2 and 3. Preemptive attacks allow you to enter commands immediately at the start of battle while enemies must endure a full wait period before their first turn. A single Pre-Emptive materia has the same effect as multiple Pre-Emptive materia with the sum of their levels equal to that of the single materia. Mythril Mine After entering (from the marsh southeast of the Chocobo farm), take the eastern path. Press O (PSX) or "OK" (PC) to climb the vine. Mega All changes the Attack command to Slash-All, which allows a character to attack all enemies (only) with 1/3 less damage than that of a normal, single attack regardless of row position. Mega All also functions as an All materia for all applicable command and magic materia a character has equipped. Check the All materia data for a list of magic materia that Mega All supports. When you reach the area where you choose paths for each party member, have Cloud take the "Left" path, then choose "Down" when the path again diverges. Once you reach the point shown in the thumbnail, press Up, then press O (PSX) or "OK" (PC) when Cloud lands on the column before landing on the opposite ledge. When an enemy damages (either with physical attacks or magic) a character equipped with Counter Attack materia, the character will automatically execute a normal attack against the enemy that inflicts a successful attack against him. A character will counterattack as many times as the number of Counter Attack materia he has equipped. - Chocobo Square If the enemy a counterattack is directed at dies, any pending counter attacks will be dispersed among remaining enemies. This materia is offered as one of the prizes at the Class A and Class S race levels. A character equipped with Cover uses his body as a shield to take damage from a normal physical attack intended for one of his party members. Kalm Use the Morph command on Ghost Ship to obtain the Guide Book item. Trade with the Kalm traveler in exchange for the materia. 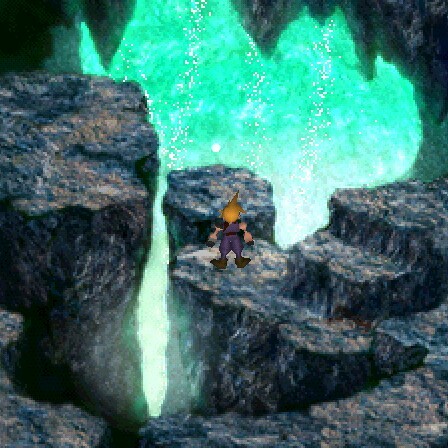 Materia cave due north of Mt. Corel on section of land separated by a river. Can be reached by using a Blue, Black, or Gold Chocobo.